Washington, DC, April 28, 2006 - Today the National Security Archive publishes for the first time 30 recently declassified U.S. government documents disclosing the existence of a highly secret policy debate, during the first year of the Nixon administration, over the Israeli nuclear weapons program. Broadly speaking, the debate was over whether it was feasible--either politically or technically--for the Nixon administration to try to prevent Israel from crossing the nuclear threshold, or whether the U.S. should find some "ground rules" which would allow it to live with a nuclear Israel. The documents published by the Archive are the primary sources for an article by Avner Cohen and William Burr, "Israel crosses the threshold," that appears in the May-June 2006 issue of the Bulletin of the Atomic Scientists. The article is now available on-line at the Bulletin's Web site. An edited version of the article will also appear in The Washington Post's Sunday "Outlook" section on April 30, 2006. 1969 was a turning point in the U.S.-Israeli nuclear relationship. Israel already had a nuclear device by 1967, but it was not until 1968-1969 that U.S. officials concluded that an Israeli bomb was about to become a physical and political reality. U.S. government officials believed that Israel was reaching a state "whereby all the components for a weapon are at hand, awaiting only final assembly and testing." In the first months of the Nixon administration, senior officials such as Secretary of Defense Melvin Laird believed it was important that Washington try to check Israeli nuclear progress for the sake of stability in the Middle East. In April 1969 national security adviser Henry Kissinger issued National Security Study Memorandum (NSSM) 40 requesting the national security bureaucracy to develop options for dealing with the Israeli nuclear problem. A Senior Review Group (SRG), chaired by Henry Kissinger, was formed to deliberate and propose avenues for action to the President. The SRG outlined policy objectives to President Nixon and proposed initiating a probe with Israeli Ambassador Rabin designed to achieve those objectives. Nixon approved the SRG's proposal for action but declined to use deliveries of advanced F-4 Phantom jets as leverage for the probe. This decision was fateful for the entire exercise. On July 29, 1969 Ambassador Rabin was summoned by Acting Secretary of State Elliott Richardson and Deputy Secretary of Defense David Packard as the first step in the probe. The two officials pressed Rabin on three issues: (1) the meaning of Israel's "non-introduction" pledge; (2) Israel's signature on the NPT; (3) Israel's intentions on the missile issue. Rabin provided no replies and subsequently proposed to leave the whole issue for the meeting between President Nixon and Prime Minister Meir in late September. On the eve of Meir's visit the State Department prepared a background paper for the President concluding that "Israel might very well now have a nuclear bomb" and certainly "had the technical ability and material resources to produce weapons grade uranium for a number of weapons." No written record of the meeting between President Nixon and Prime Minister Meir on September 26 is available, but it was a key event in the emergence of the 1969 US-Israeli nuclear understanding. Subsequent documents suggest that Meir pledged to maintain nuclear restraint-no test, no declaration, no visibility-and after the meeting the Nixon White House decided to "stand down" on pressure on Israel. On October 7, 1969 Ambassador Rabin formally provided his belated answers to the US questions: Israel will not become a nuclear power; Israel will decide on the NPT after its election in November; Israel will not deploy strategic missiles until 1972. On February 23, 1970 Ambassador Rabin informed Kissinger that, in light of President Nixon's conversation with Meir in September 1969, Israel "has no intention to sign the NPT." Subsequently, the White House decided to end the secret annual U.S. visits to the Israeli nuclear facility at Dimona. Lower-level officials were not told of the decision and as late as May 1970 they were under the impression that the visits could be revived. The newly declassified documents are from State Department records and Nixon Presidential Materials at the National Archives, College Park. They represent, however, only a small fraction of a large body of documents on NSSM 40 that remain classified. To elucidate the U.S. government debate over the issue of the Israeli bomb the National Security Archive has filed declassification requests for those key documents. Prepared for meetings at the LBJ ranch between President Johnson and Prime Minister Eshkol, this paper presented the assessment of the Department of State's Near East bureau that Israel had not started a dedicated nuclear weapons program. A year later, the Near East Bureau in concert with the State Department's Bureau of Intelligence and Research and the Arms Control and Disarmament Agency held a more decided view that Israel had started a nuclear weapons program to the extent that it had taken a "number of steps which … would reduce substantially the time needed to develop a deliverable nuclear weapon." The Nixon White House informed the State Department and other agencies of its limited commitment to the nuclear proliferation Treaty by forbidding any "plan to bring pressure on … countries to sign or ratify." A paper prepared by a Democratic holdover from the Johnson administration suggests the growing apprehension within the State Department over Israel's nuclear progress. As one of the new men in charge of a major component of the national security bureaucracy, Laird's worries about Israel's nuclear progress carried far more weight than Owen's and probably contributed to the White House decisions that led to NSSM 40. The concerns about the Israeli nuclear program expressed by an important player in Middle East policy, Assistant Secretary of State for the Near East and South Asia Joseph Sisco, reflect the growing apprehension over the Israeli nuclear program within the State Department and may likely have contributed to the decision to promulgate NSSM 40. Sisco's document shows the extraordinary sensitivity of the subject and the recognition by key State Department officials that the U.S. could do very little to address the situation, short of a showdown with Israel. The text of NSSM 40 remains classified but this document suggests Harold Saunders and Morton Halperin prepared a draft of the document. The Senior Review Group (SRG), chaired by national security adviser Kissinger, oversaw the preparation of responses to NSSMs. Given NSSM's 40 highly secret status, only a small group of officials at the White House, State Department, CIA, and Defense Department were cognizant of the discussions of U.S. policy toward the sensitive Israel nuclear program. This account of the meeting shows the strong interest that key players such as Deputy Secretary of Defense David Packard and Under Secretary of State Elliott Richardson had in finding ways to check the Israeli nuclear program. It also suggests that at that stage members of the SRG, except perhaps Kissinger, did not know President Nixon's views on these matters. Henry Kissinger may have had a major role in the drafting of this strategy document, but its exact status is uncertain; it accurately depicted the major views within the SRG on the possible uses of pressure to curb the Israeli nuclear program. A supporter of the use of diplomatic pressure against the Israeli nuclear program, Under Secretary of State Elliott Richardson told Deputy Secretary of Defense Packard that he was unwilling to deploy it at the initial meeting with Rabin. A telephone conversation that Richardson had later that day with Kissinger showed that if Richardson thought that Phantom jets could provide useful leverage during a probing operation of Israeli nuclear intentions, such a possibility had become out of the question. Kissinger told him that Nixon was "leery" of using the F-4 to exert pressure. 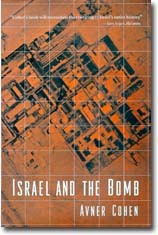 A critical part of the NSSM 40 exercise was to send a message to the Israelis about the U.S. government's concern with them over the state of their nuclear program; with this memo Sisco provided Richardson with the "talking point" to be used in conveying to Rabin "how troubled" the administration was. Part of the conversation with Rabin touched upon his request to accelerate the delivery date of Phantom jets to Israel; this cable to the U.S. embassy in Tel Aviv showed that Richardson and Deputy Secretary of Defense David Packard had rebuffed Rabin's request for advance delivery of the F-4s. Richardson sent Nixon an overview of the talks with Rabin along with a detailed memorandum of conversation. As the latter shows, Richardson read Rabin a tough statement, then left him three questions to consider, but insofar as Nixon had ruled out any use of pressure on the Israeli government the State Department had no leverage to induce Prime Minister Meir and her cabinet to change course. The U.S. team that visited the Dimona facility in July 1961 found that it could not make a "full examination"; the Israelis had "restricted" the visit to such an extent that U.S. Ambassador Walworth Barbour vainly asked Prime Minister Meir for an additional visit. Part of the problem, the AEC participants believed, was that the U.S. government "is not prepared to support a real 'inspection' effort in which the team members can feel authorized to ask directly pertinent questions." In light of Rabin's non-answer to the questions on Israeli nuclear policy that Richardson had raised in late July, Rodger Davies, an important player in NSSM 40 activities at the State Department, advised Richardson to remind the ambassador that he was still interested in the answers. The next day, Rabin explained the delays to Richardson by observing that "it was a difficult subject for his government to deal with a month before the election." Whatever information Richard Helms had delivered to President Nixon on September 8, 1969 has since vanished from the file, but the writing-"to be opened only by: The President"-shows the extreme sensitivity associated with information on the Israeli nuclear weapons program. To help Nixon prepare for his meeting with Prime Minister Meir, the State Department prepared a detailed briefing paper with talking points on key issues, including the nuclear program. The State Department authors of the talking points suggested that Nixon use language critical of Israel's nuclear program: "Israel's possession of nuclear weapons … would [not] provide Israel with the security it is intended to serve." State Department briefing materials, however, may not have been a significant input into Nixon's thinking about the meeting, because he routinely depended on briefing information provided by Kissinger and the NSC staff. This paper, drafted by the Israeli desk at the State Department with the concurrence of the CIA and other agencies, provided an up-to-date intelligence assessment of the Israeli nuclear weapons program: "Some have reservations about whether or not Israel has produced and assembled a complete nuclear weapon, but do not dispute the likelihood that she could and soon might." In the wake of the Nixon-Meir meeting, Kissinger obtained from Rabin answers to the three questions asked by Richardson. Kissinger forwarded the questions and answers to Nixon. The next day, Kissinger provided Nixon with a detailed analysis of Rabin's answers and the extent to which they were acceptable. 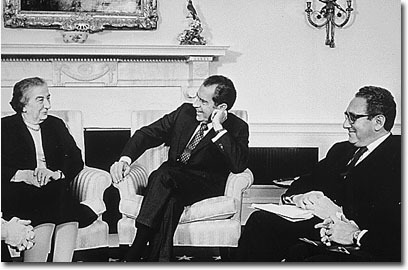 A key issue was the question of "possessing" nuclear weapons; while Richardson (following Warnke's line in November 1968) had sought assurances that Israel would not possess them, Kissinger was content to accept a private assurance that Israel was a "non-nuclear weapons State" because it "would in effect ask the Israelis to accept privately the key obligation of the NPT." In mid-October, Rabin met with Richardson to answer the questions he had raised in late July (for the State Department account of the meeting see the next document). 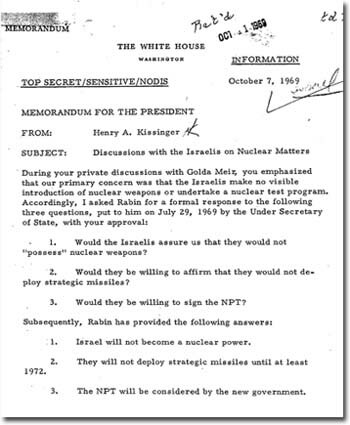 Around the same time, Rabin provided the answers directly to Kissinger. Commenting on recent exchanges with Rabin, including Richardson's, Kissinger argued that the "advantage of their new formulation is that it should put us in a position for the record of being able to say … we have Israel's assurance that it will remain a non-nuclear state as defined in the NPT." Ultimately that would provide the administration with a "rationale for standing down"-relaxing pressure on the Israeli nuclear question. During the months after the Meir-Nixon meeting, Ambassador Barbour and Joseph Sisco vainly sought access to any record that Nixon had kept of his meetings with the Prime Minister and that Nixon had promised to make available to them. NSC staffer Harold Saunders observed that "there is something to be said for providing the three or four people most responsible for carrying out the President's wishes with an accurate reading … of what that policy is." Kissinger, however, could or would not help because, as he scrawled on the top of Saunder's memo: "have never seen." It is not clear where or whether those minutes still exist today. Rabin had said that Israel's position on the NPT would not be forthcoming until after the elections. For major players in the U.S. national security bureaucracy, such as Sisco and JCS Chairman Earle Wheeler, Israel's signature on the Treaty remained a desideratum and the U.S. "ought to push the NPT urgently." When Ambassador Rabin told Kissinger that the Israeli government had made up its mind that it was not going to sign the NPT it meant that earlier U.S. pleas on behalf of the treaty had proved useless. The Nixon-Meir understanding meant that there would be no more pressure; as long as the Israelis kept their program restrained and invisible, Washington would "stand down" from attempts to check their nuclear ambitions. The word that there would be no more pressure on Israel reached the middle levels of the bureaucracy slowly, if at all, or they were not willing to take no for an answer. Thus, in mid-1970, Robert Munn at the Israeli desk vainly tried to raise the question of another intelligence visit to the Dimona facility. According to the recollections of former Secretary of Defense Melvin Laird, Kissinger, fearing being "outvoted," made it impossible for the State Department's proposal to be brought up at the SRG level. A request from a U.S. congressman for information on the State Department's "knowledge" of the Israeli nuclear program led to a debate within the Department over whether it should go as far as the CIA in acknowledging its belief that "Israel has already produced nuclear weapons." State Department officials wanted to make a far more equivocal statement not least because, if leaked, it "would have the effect of fact and thus inspire profoundly negative political repercussions in the Middle East and among our allies." Attached to the memorandum is what is probably the first page of a National Intelligence Estimate on nuclear proliferation issues. This list of NSSMs was discovered just before this briefing book went on-line. It shows that the title of NSSM 40 was "Israeli Nuclear Weapons Program" and that the title was classified at the time owing to its sensitivity. 1. "Exdis" or exclusive distribution. 2. "Nodis" or no distribution without permission. 3. These and related documents are also on-line in a briefing book prepared by Avner Cohen for the National Security Archive, to announce the publication of his 1999 book, Israel and the Bomb. 4. For more information on the efforts of U.S. intelligence to monitor the Israeli nuclear weapons program, see Jeffrey Richelson, Spying on the Bomb: American Nuclear Intelligence from Nazi Germany to Iran and North Korea (New York: Norton, 2006).